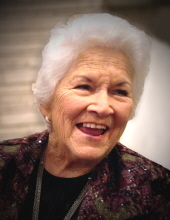 Doris L. East was born in Mountain View Oklahoma on October 22, 1932 to Sie and Hallie Burleson. She went to be with her Lord and Savior on March 12, 2019 at the age of 86. Services for Miss Doris will be at 2:00 in the afternoon, Friday March 15, 2019 at Walnut Creek Baptist Church in Diana, Texas. Services are under the direction of Grubbs-Loyd Funeral Home in Diana. She was affectionately known as “Miss Doris” and “Nana” to her grandchildren and great grandchildren of whom she was very proud. She was a believer in and a follower of Jesus Christ her Savior. She loved flowers and gardening. Miss Doris was a great cook, her specialty being chicken and dumplins. One of her greatest joys was having her whole family together for a big meal. She is survived by her loving husband Dewey N. East, three sons; Larry East and wife Sue, Richard East and wife Maureen and Charles East. Six grandchildren and fourteen great grandchildren. Doris and Dewey were married February 4, 1950 and had a happy union of 69 years. She was preceded in death by her parents and her brother Charlie Burleson and his wife Olena. Visitation will be held Thursday evening 6:00 to 8:00 PM March 14, 2019 at the Grubbs-Loyd Chapel in Diana. To send flowers or a remembrance gift to the family of Doris L. East, please visit our Tribute Store. "Email Address" would like to share the life celebration of Doris L. East. Click on the "link" to go to share a favorite memory or leave a condolence message for the family.